The Big Bertha Extension Mine (just one of its many names) is famous for bladed hematite and zunyite (a volatile-rich aluminosilicate). 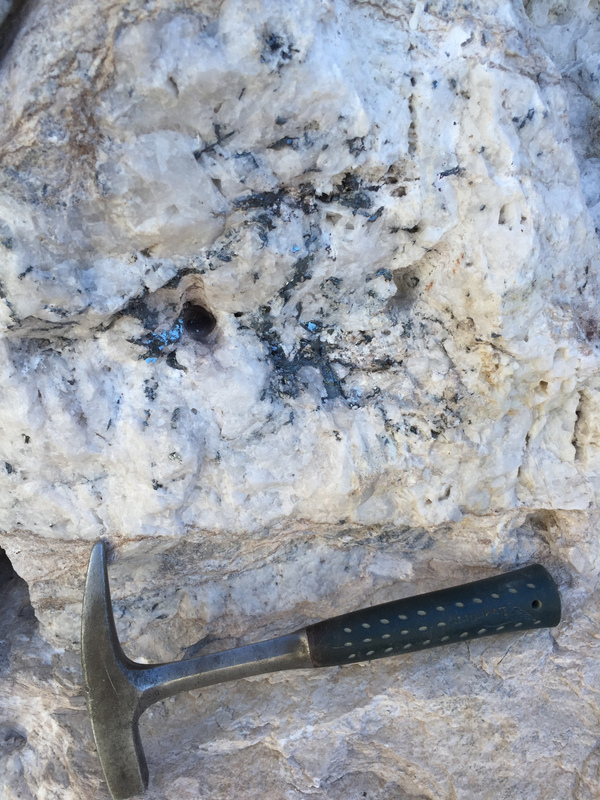 Though I didn't find anything that was convincingly zunyite when I visited, I did find abundant, spectacular specular hematite. 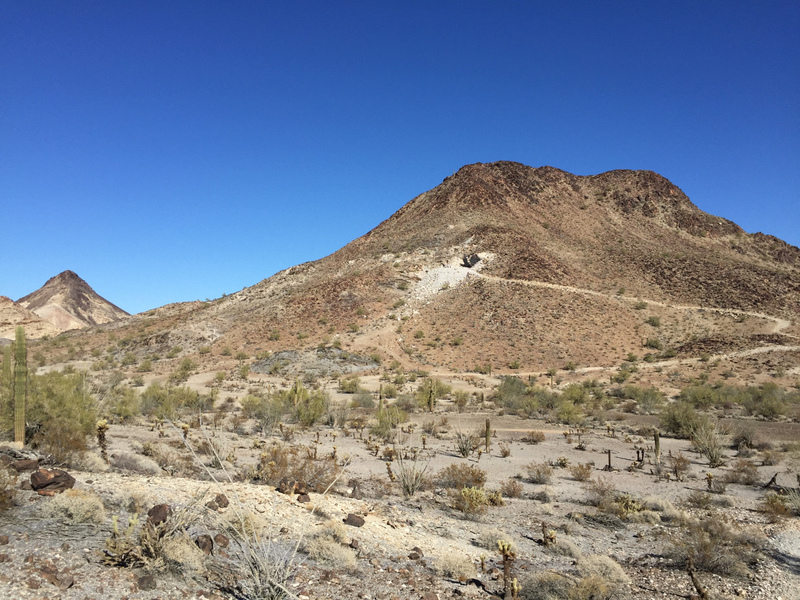 The mine can be accessed through a maze of variable-quality roads immediately south of I-10. I'd recommend picking up a copy of Bearce's guide to Arizona mineral collecting (referenced below), as he provides a useful mileage log for navigating the impressively confusing road network. 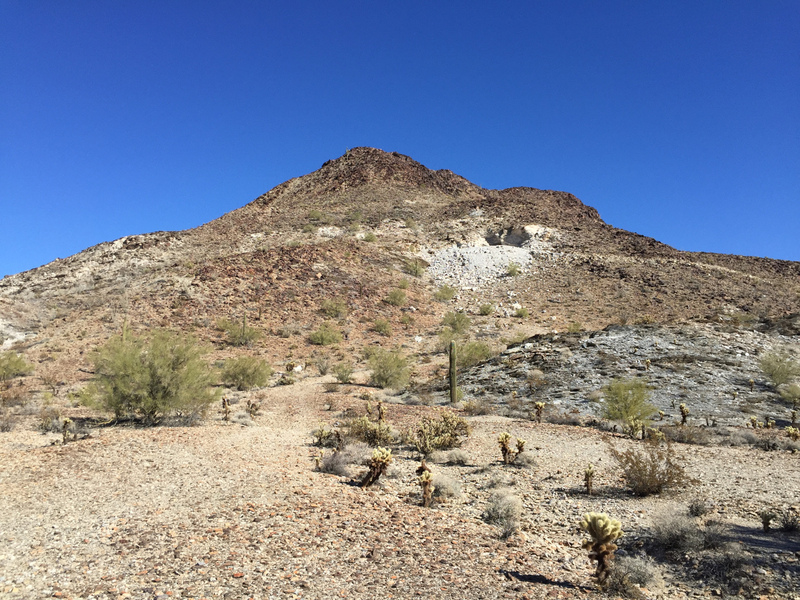 If you don't have a high clearance vehicle, or if you aren't confident in your backroad-driving skills, I'd recommend taking the main pipeline road to a relatively good dirt road on the east side of the mountain that hosts the mine. You can drive down this road until the mine comes into sight (before crossing the major wash), at which point it should be a relatively easy walk over to the mine. The geology of the mine is very interesting. The specular hematite blades are hosted in masses of crystalline quartz. 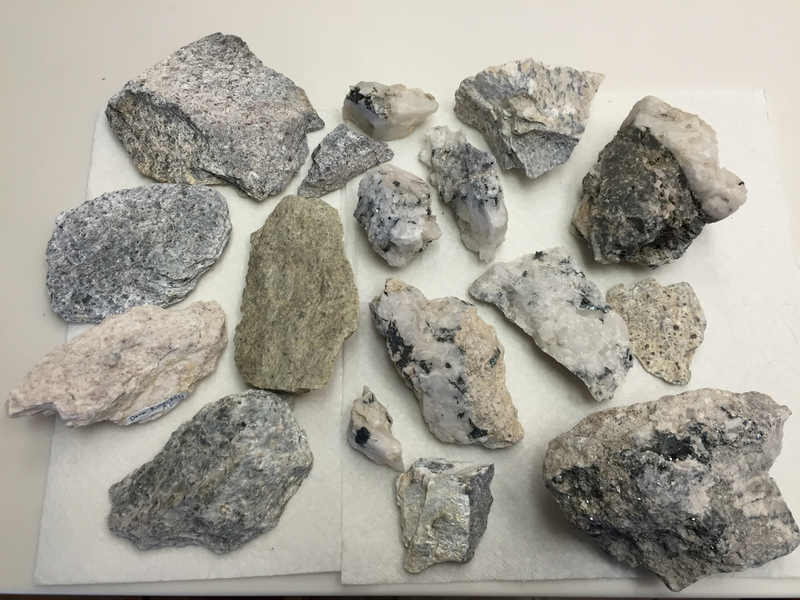 These quartz-hematite bodies are themselves hosted within sheared metaigneous rocks. 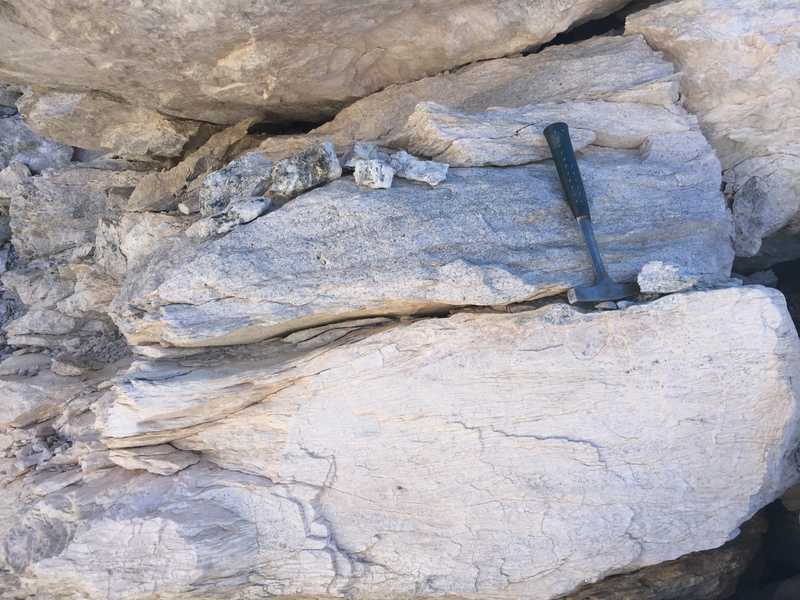 These metaigneous rocks may have originally formed during the Jurassic as a hypabyssal (shallow) quartz porphyry intrusion (based on regional geology), but they have subsequently been variably deformed and metamorphosed. 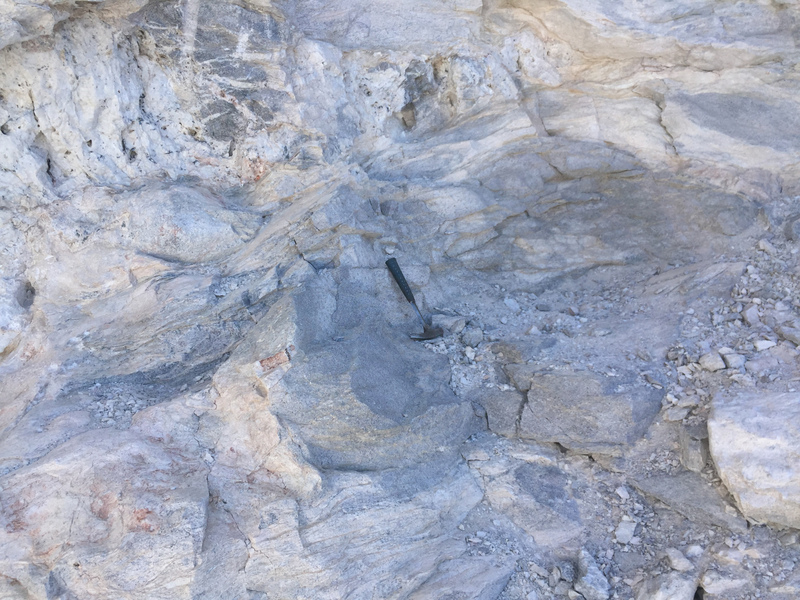 Shearing within the mine rock is localized into subhorizontal shear bands, within which the rock appears to have been metamorphosed to a talc/tremolite/mica schist with quartz porphyroclasts. 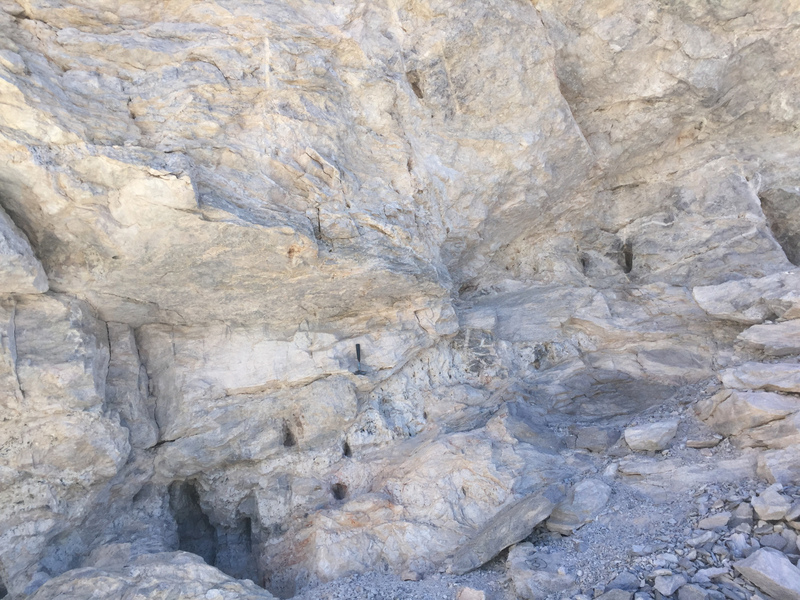 Quartz-feldspar augens and igneous "knockers" (a term used by Californian geologists to denote competent, undeformed blocks of rock that have been rolled around in a shear zone) are visible at a range of scales in the mine walls. 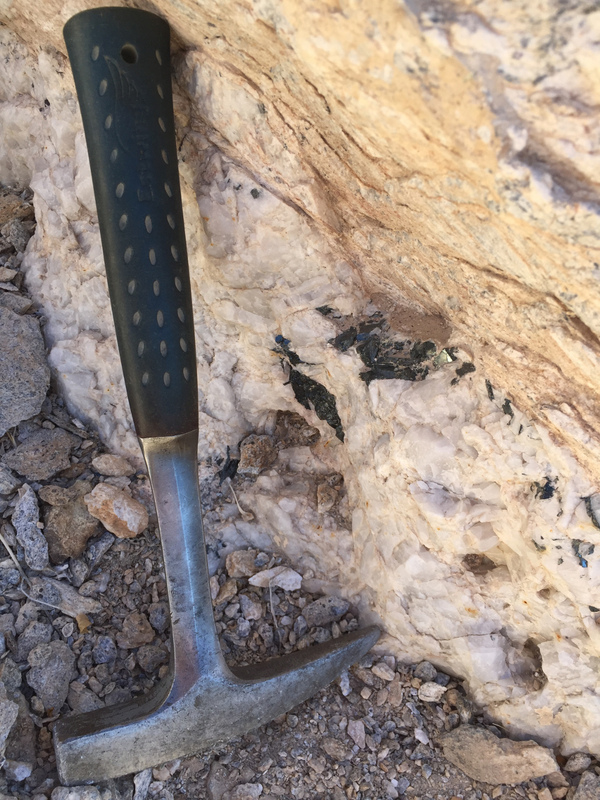 It is unclear how the hematite-quartz masses relate to this shearing. They do not appear to be sheared, but they generally wrap around the knockers and are concordant with the developed foliation. Furthermore, their contacts with the deformed host rock vary from sharp to vaguely gradiational. 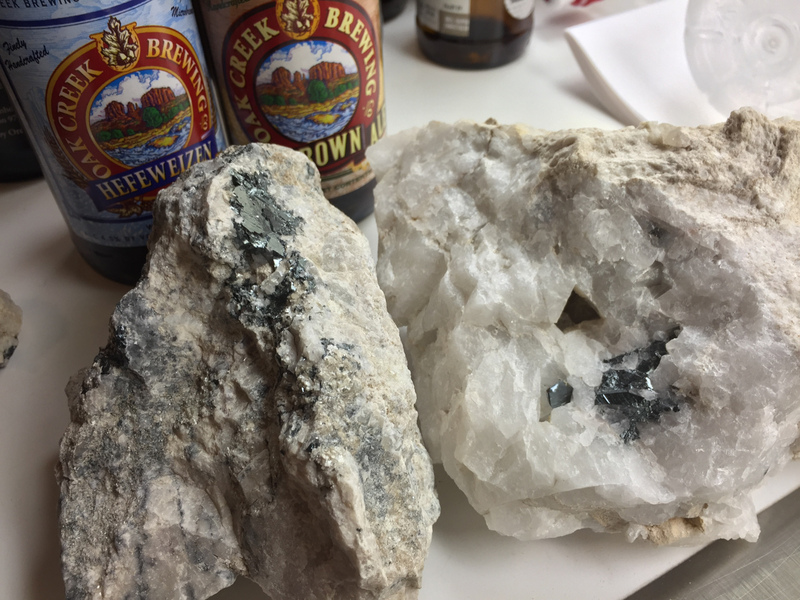 More broadly, the country rock surrounding the mine is composed of a range of metavolcanic (or meta-hypabyssal) rocks and isolated pockets of phyllite or soft mica schist with quartz porphyroclasts. 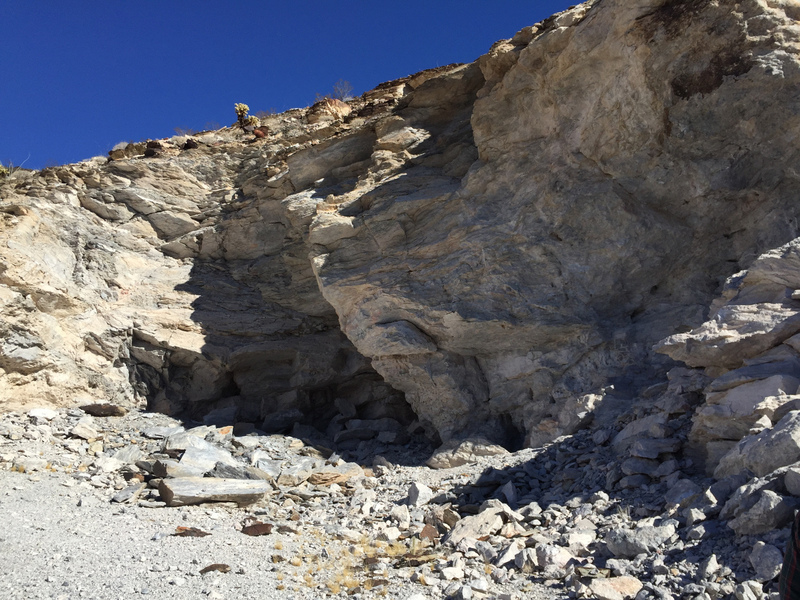 It appears that very little scientific work has been done on the rocks in the immediate mine area. Too bad, because these rocks certainly tell a crazy story. Note that the Mindat entry for the mine provides the wrong coordinates. Those coordinates are for a cluster of shafts and adits just off the pipeline road on the north side of Sugarloaf Peak. These mines are not that interesting, although there is a little bit of disseminated pyrite to be found there. 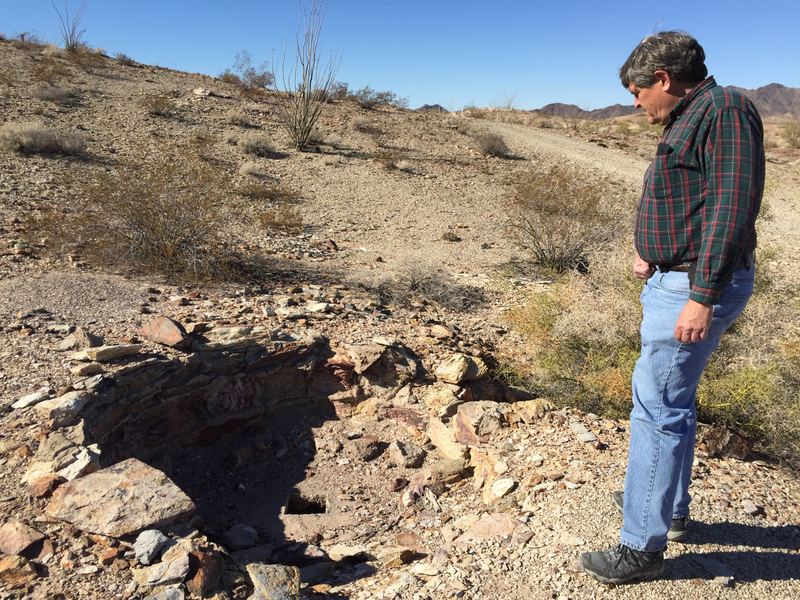 You can also see the remains of an arrastra (used for grinding up gold ore) there as well. M. Sprunger, Hematite from the Dome Rock Mountains near Quartzsite, Arizona: The Mineralogical Record, July-August 1980, p. 227-229. W.E. Wilson, What's New in Minerals? : The Mineralogical Record, May-June 1986, p. 207-212.